The sparkle of a crisp winter evening set the tone for the concert by the Dover Quartet (violinists Joel Link and Bryan Lee, violist Milena Pajaro-van de Stadt, and cellist Camden Shaw) on Friday evening at the Shalin Liu Performance Center in Rockport. Steeped as the players are in the traditions of their acknowledged mentors, the Guarnieri, Cleveland, and Vermeer Quartets, the Dovers brought a youthful freshness combined with confident musicianship and fine-tuned expressive nuance to favorite works by Mozart, Britten, and Beethoven. Seeking a wider exposure for his music, Mozart journeyed in the spring of 1789 to the major cities of Prussia: Leipzig, Dresden, and Berlin. Although he came away with a commission for six new string quartets from the enthusiastic monarch/cellist Friedrich Wilhelm II of Prussia, he completed only three of them. In severe financial straits at the time, he never sent the promised quartets to the king, but sold them instead in 1790 to the Viennese publisher Artaria, who finally announced their publication shortly after the composer’s death in December 1791. Friday night’s program opened with the second of the so-called “Prussian” quartets, K. 589 in B-flat major, composed in May 1790, after the highly successful premiere in January of Così fan tutte. Sweetly lyrical playing of the opening theme by the Dover violins was enriched by hints of imitation in the viola and cello. In the development section, that sweetness gave way to wide leaps, incisive offbeat accents, and chromatic enhancement, culminating in a cadenza-like rush of triplets in the first violin, only to slither into a re-scored reprise of the opening. The second movement, Larghetto, gave special prominence to the king’s instrument. Camden Shaw introduced both of the principal themes with muted lyricism, always balanced by beautifully coordinated ensemble. The Menuetto, a delightful mixture of courtly and rustic modes, found the Dover players showing a keen awareness of stylistic contrasts. In the Trio, hurdy-gurdy noodling in the first section preceded a ghostly and perversely accented half-step motive in the second section before the return of the rustic theme in the first violin. The richly scored Finale in a rollicking 6/8 went by like the wind, its air of innocence belying a greatly expanded pattern of varied repetitions offset by offbeat excursions and unexpected harmonic twists. As recounted by violist van de Stadt, Benjamin Britten’s Quartet No. 2 in C Major, Opus 36 was written in 1945 just after the composer and violinist Yehudi Menuhin returned from a tour of Germany, where they played for concentration camp survivors. The premiere took place on November 21, 1945, the 250th anniversary of the death of the English composer Henry Purcell, an observance that seems to have provided an additional emotional anchor to the quartet. With the viola playing a drone, the first movement opened with a gradually-evolving C major chord outlined in the other instruments before introducing more pungent harmonies and stridently dissonant passages, only to return at the end to a calm but sorrowful C major over percussive pizzicato in the cello. The Vivace that followed opened on a repeated-note figure and continued in perpetual motion, with all four strings muted. Homage to Purcell was embodied in the third movement, Chacony, in the choice of both title and technique. The nine-bar chaconne bass theme was introduced at the opening and followed by twenty-one variations that thickened the harmonic and rhythmic texture with strident chords punctuated by solo cadenzas, but returned at the end to a triumphant C major. Energetic and virtuosic playing demonstrated the Dover’s passionate commitment to this work. The Andante con moto introduction to Beethoven’s C Major Quartet, Opus 59, No. 3, played after the intermission, opens with a search for harmonic clarity reminiscent of the off-key introduction of his own first symphony, but even more strongly of Haydn’s depiction of chaos in the introduction to The Creation. The first chord, a diminished seventh built on F sharp in the cello, belongs to no key at all. As the cello moves gradually downward, the first violin rises, bringing the voices farther and farther apart, until they finally land on the dominant. Now a strong resolution is expected, but instead Beethoven opens the Allegro with two tentative statements of a violin theme before all four instruments come crashing down 14 measures later to establish both key and tempo with a downbeat C major chord, forte, reinforced with double stops and pounding eighth-notes in the cello. The Dover players handled the gradual evolution from chaos to order in this passage with carefully controlled restraint, maintaining a suspenseful atmosphere throughout. After the development, the return of the Allegro is heralded by harmonies borrowed from the conclusion of the introduction, then launches into an ornamented version of the violin theme that functions almost like a cadenza leading to the emphatic C major downbeat. Here again the players captured the feeling of suspense we experienced earlier in the movement. In the second movement, Andante con moto quasi Allegretto, they maintained the lyrical 6/8 pace of the exotic-sounding melody over cello pizzicato, conveying nostalgia but never sentimentality, the mood darkening at the end in the pianissimo cello conclusion. There was plenty of virtuosic passage work passed from one instrument to the other in the Menuetto and its syncopated Trio, all executed with sure-footed panache. The Coda brought more harmonic mystery, ending on a dominant seventh that barely prepared us for the headlong rush (attacca subito) of the Allegro molto fugal opening. Although the fugal texture is sporadic, the running eighth notes almost never stop. When they do, the effect is dramatic, as when they introduce the return of the fugue, now with a new counter-theme in staccato half-notes. What made the Dover’s performance so convincing was their absolute control of rhythm and dynamics through multiple shifts in phrasing and texture right up to the madcap fortissimo skirmish of the coda. 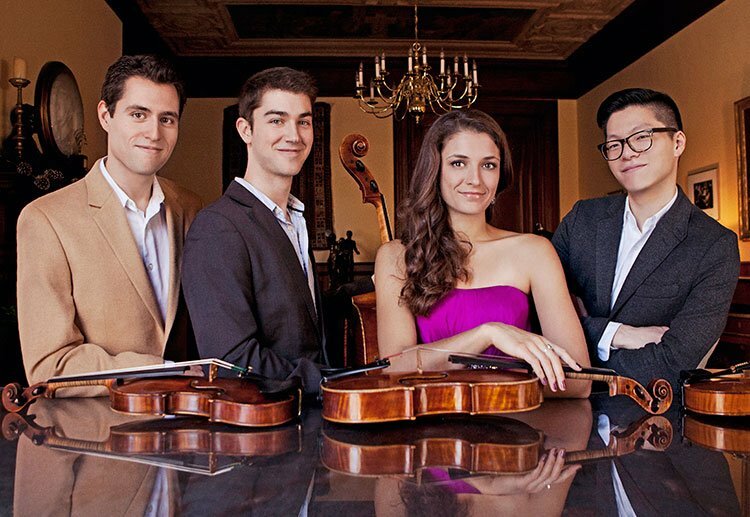 We’re eager to hear more from this accomplished quartet, whose debut CD, containing Mozart’s Prussian Quartets in B-flat and F Major along with his Quintet in C Minor with violist Michael Tree, has just been issued.